The right-wing politician cites a supposed grammatical error as justification for a new constitution. Ishihara Shintaro – formerly the governor of Tokyo, now a member of the Japanese Lower House – is leading the political crusade in Japan to draft a new constitution. From his perspective, the existing 1947 Constitution has, for almost 70 years, subjected Japan to a document written by foreigners, thus depriving Japan of its political and military autonomy, which he regards as an affront to Japanese national pride. 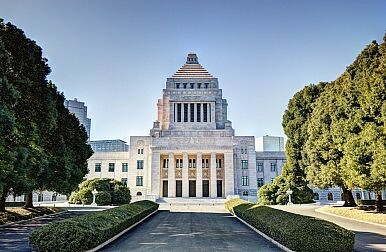 The basic policy of Ishihara’s new Party For New Generations, launched in June this year, includes proposals to make amending the existing constitution easier and to reinterpret it to enable Japan to participate in collective defence as well as to draft a new constitution that does not renounce war. On October 31, Ishihara launched an attack in the Diet on the way in which the Constitution, originally drafted in English, had been translated into Japanese. He pointed out that in the sentence that states ‘trusting in the justice and faith of the peace-loving peoples of the world’ (heiwa o aisuru shokokumin no kōsei to shingi ni shinrai shite) is grammatically incorrect in terms of the use of the particle ni. He argued that kōsei to shingi “ni” shinrai shite (“trusting in the justice and faith”) should be kōsei to shingi “o” shinrai shite (“trusting the justice and faith”). He added that making a small correction to this grammatical error would eventually lead to the establishment of an “autonomous constitution” (jishu kenpō). Ishihara’s aim was to take another small step to erode the legitimacy of the 1947 Constitution in a way that would appeal to Japanese nationalists. However, the question is whether Ishihara is actually correct in his view. Grammatically speaking, while the use of “ni” shinrai shite is not common in everyday Japanese conversation today, it is actually acceptable. One example is the phrase shu ni shinrai shite, which is the standard translation for “trust in the Lord,” and which can be found on Japanese church websites and in Bible translations into Japanese. An essay written by a researcher for the National Institute for Japanese Language referred to several examples from Japanese literature where the authors used “ni” shinrai shite, including famous authors such as Natsume Sōseki, a Japanese novelist of the Meiji period, and Akutagawa Ryūnosuke, a writer active during the Taishō period. During these past imperial reigns, including in the Shōwa period, “ni” shinrai shite was in common use. Moreover, a search of “ni” shinrai shite on google.co.jp reveals 1.6 million hits in 0.44 seconds and 51,000 hits when written with quotation marks. Last but not least, “trusting in the justice and faith” has a different nuance from “trusting the justice and faith” in the English. At the time of the original translation of the wording of the new constitution into Japanese, it captured the meaning of the English correctly and was the most fitting in the context of a constitutional Preamble and the way in which the text flowed. On balance, for all these reasons, Ishihara does not have a case to attack the Japanese Constitution on the grounds of its having been rendered into Japanese in a grammatically incorrect way. His position was publicly endorsed, however, by Prime Minister Shinzo Abe. They share the basic standpoint that the US-imposed Constitution is a symbol of Japan’s “humiliation” by a foreign power, its defeat in war, and its continuing political and military emasculation. In fact, Abe made a point of saying in response to Ishihara that, “It is just like you, a man of letters, to point something like this out. I also had to mindlessly memorise [the Preamble] when I was in junior high. My teacher told me that it was a beautiful piece of writing, but I remember feeling somewhat angry about it as a child…” He reminded Ishihara, however, that even revising a single [Japanese] character in the Constitution would require a constitutional amendment, which he hoped that discussions in the Diet between the two leaders could initiate. Aurelia George Mulgan is professor of Japanese Politics, University of New South Wales, Australian Defence Force Academy, Canberra, Australia and author of six books on Japanese politics (most recently Ozawa Ichiro and Japanese Politics: Old Versus New, Nissan/Routledge 2014). After the Presidential Election, What Next for Abe and the LDP? After a sweeping victory against a rival LDP member, Abe secures a new 3 year term as party leader -- and prime minister.